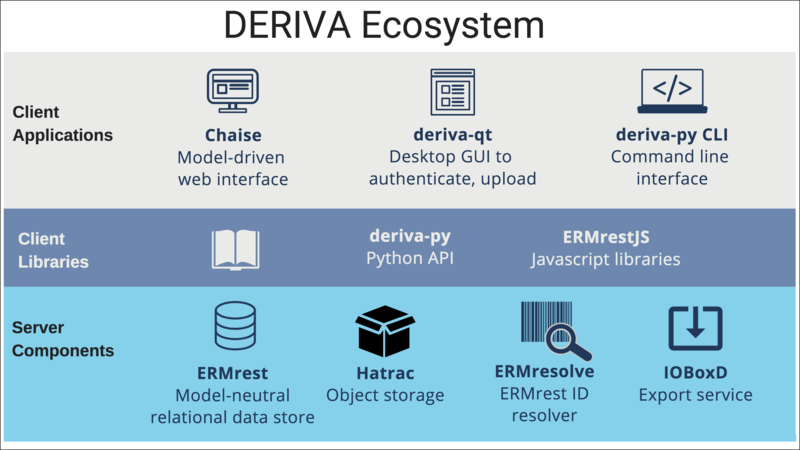 At DERIVA’s core are a suite of server components that store the data, describe the data model, represent the data and provide exporting capabilities. Client applications offer a 1) web interface that represents the data, data model and filtering/search capabilities for discovering data, 2) a desktop GUI that data submitters can use to authenticate with the deployment and upload data files and 3) command line interface for interacting with the data. Let’s take a closer look at each of these layers. ERMrest is an entity/relationship database web service that acts as a powerful metadata catalog for the data. It enables rich data models and lets you create, then evolve data models that accurately represent the concepts of your domain. RESTful web services such as: entity, attribute, schema, table, column, etc. Enforcement of policies at row-level access, providing fine-grained security. Guarantee of data fixity via immutability (non-jargon) and checksums to ensure data integrity. Versioning - tracks different versions of data in a non-destructive way. ERMresolve is a trivial identifier resolver and redirect service to help cite entities in an ERMrest catalog. The sole purpose of this service is to provide an easily managed URL space to use in support of data citation. It is designed to complement the use of CURIEs a.k.a. Compact URIs to form short, permanent, and resolvable identifiers. Typical use would be to associate a CURIE prefix with an ERMresolve deployment - this means a CURIE resolver could translate the CURIE into a valid ERMresolve HTTP URL and then fetch that resource to obtain cited data from ERMrest. IOBoxd is the “messenger service” of DERIVA and communicates between a DERIVA deployment and external data sources. File Upload for uploading data from your local environment. This tool is best when your uploading from your own computer and it’s not a very large amount of data.